When it comes to economic ideas, Daron Acemoglu never thinks small. Widely acknowledged as one of the most insightful economists alive, Daron seems to have brilliant things to say about any and all things economic. When you have that sort of gift, you might as well go after the biggest problems imaginable. 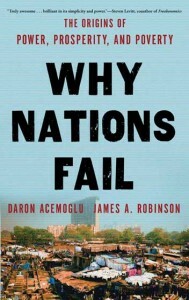 Thus his latest book, Why Nations Fail , written with Harvard political scientist James Robinson. Daron Acemoglu is the Killian Professor of Economics at MIT and a 2005 John Bates Clark medalist. James A. Robinson is the David Florence Professor of Government at Harvard University. This post is no longer accepting comments. The answers to the Q&A can be found here. This book looks very interesting, in particular chapters 3, 11, 12, 14, and 15. What are the thoughts on similarities between the politically powerful opposing the industrial revolution and technology revolutions today? People are always afraid to lose what they have. How can we create an environment without fear? Rail freight charges fell by 90 percent between 1870 and 1900. There is little doubt that [Cornelius] Vanderbilt sometime bribed and bulled his way to success, and that he sometimes paid his workers lower than others -- I am not trying to make him into a saint -- but there is also no doubt that along the way he delivered to consumers an enormous benefit that would otherwise have eluded them -- affordable transport. Likewise, Andrew Carnegie, while enormously enriching himself, cut the price of a steel rail by 75 percent in the same period; John D. Rockefeller cut the price of oil by 80 percent. During those thirty years, the per capita GDP of Americans rose by 66 percent. They were enricher barons too. So actually, the actions undertaken by Roosevelt to disrupt the robber barons seems to be best understood as needless government meddling rather than part of some virtuous cycle. What is your response? *sigh* -- should read "isn't presented"
Early in the book you dismiss culture as an explanation for economic success or failure, noting that while countries such as the US, Canada, Australia and New Zealand were all colonized by the British and are economically successful that Sierra Leone was similarly colonized and is a failure. But given that Sierra Leone was largely population by natives rather than British expats -- in stark contrast to the other countries mentioned -- can it really be presented as an example of British culture? If Sierra Leone were -- like Canada, Australia and New Zealand -- populated by British ex-pats rather than natives, does it not stand to reason that its economic history would be far different (and that its political institutions would have been far more successful)? How crucial to success/failure is the fact that many "nations" in the developing world are actually artificial constructs, i.e. legacies of colonial-era maps that papered over tribal/ethnic boundaries . Daron, how do you pronounce your last name? Is it the Turkish way /ad?emo:'lu/ (ah-jem-OH-loo) or an Americanized way /æ'semo:glu/ (A-sem-oag-loo)? Or more importantly, when discussing your work in English, how would you prefer us to pronounce your name? When I first read your stuff, I had just moved to New York from Istanbul so I naturally pronounced it the Turkish way and no one had any idea who I was talking about. While it is easy to imagine policies that change or develop formal institutions, how does one go about changing informal institutions? Is it best to do indirectly? To what degree should states even involve themselves in trying to change informal institutions? If culture isn't the reason for poverty on a national level, is it (can it be) at a local level? I look at Chinese and Vietnamese immigrants and I do not see multigenerational poverty, but I do in black communities. If not culture, then why? Short question but surely long answer but maybe can you summarize? what would be your institutionalist explanation of the current euro mess? How much wood would a woodchuck chuck if a woodchuck operated under the threat of extractive institutions? many of the institutions that propagate stratification today are supranational: international corps, international finance, WTO, etc.- my question is: is it even feasible to form national institutions to protect sovereign domestic policy to alleviate capital expropriation, or must international institutions be mobilized in order to combat failed national (economic) imperialism? I have been following the Why Nations Fail blog with fascination. In a recent post you defended democracy from the charge that the "uneducated masses" of poor countries are not fit to elect functional governments. I wondered if you have looked at the role of democracy in STABILISING political cultures too? I have been reading a lot lately about the instability of medieval monarchies, which surprised me because I'd always assumed that monarchies at least would be stable as power passed from father to eldest son. Instead assassinations, coups and revolutions seemed common in many monarchial countries. I notice that modern, established democracies by contrast tend to be quite stable; the riots in Britain last summer were never expected to cause an actual revolution, for example. My own guess is that democracies, if they manage to persist for a few generations, tend to develop a legitimacy that other forms of government lack. By lowering the stakes of power changes - losing parties know they have another peaceful shot at power in a few years at the next election - they probably make participants less desperate to win by any means. These are just casual thoughts, though, so I wondered if you'd explored the role of democracy in these terms? Do you think that we have truly convincing empirical evidence that property rights institutions are one of the deep determinants of economics growth, or do you think that our evidence 'merely' suggests that social stuff matters more than geography or trade openness? While the latter is still impressive, it leaves much more room for other social explanations, such as those based on cultural factors. *Unless I am mistaken, the book punts a bit on the definition of institutions. autocorrect glitch. "a night level of trust" should have read "...a high level of trust..."
IMHO There are some great comments, and questions on Amazon which require some rebuttal from the authors before they dig in here. If I wanted to learn more about your model of political economy which of your journal articles should I go read? I've already looked at your previous book 'The economic origins of democracy and dictatorships'. Correction: It should be 'Economic Origins of Dictatorships and Democracy'. How do you pronounce your last name, Daron? I am reading the book at this point in time. I am about half way through it. One question that arises in my head is modern American and how corporate America is turning into less and less organizations from bigger and bigger corporations. Our political system is supporting two point of views that do not represent the majority. Is modern American corporate/business culture slowly become extractive drifting away from an inclusive nature? I have been really enjoying the book, but I was surprised to see that there seems to be no discussion of the possibility that racial differences in IQ *might* explain some of the differences in economic success across countries (unless I've missed it). I'd be interested to know what your views are regarding this possibility, as well as why it wasn't discussed in the book (even if only in the section on "explanations that don't work")? On the face of it, this explanation seems like it would at least be on the table, given for instance the substantial heritability of IQ and the relatively large correlation between national IQ and per capita income . Or (as far as race) the fact that in the MN transracial adoption study, the black/white IQ gap remained at over a full standard deviation even after adoption into middle class families . I'm not suggesting that these arguments are decisive, just wondering why they aren't worthy of discussion.